Rio de Janeiro, seen through any visitor’s eyes, is an exotic city where color and music thrive; and while cariocas (Rio residents) will agree, it is this fact, and so much more that makes the ‘Marvelous City’ both infectious and impossible to replicate. Airport arrival at Rio de Janeiro. The Carioca City has a magical quality and offers the traveler a wide variety of touristic sights and a daily program with great number of leisure activities. Transfer from the airport to the hotel located on the famous beach of Copacabana. Accommodation. After breakfast, we will take the metro to witness the carioca lifestyle in Rio de Janeiro. This activity includes a guided walking tour of the historical and commercial downtown of Rio, highlighting the Cathedral and the Saara neighborhood. The tour also includes one stop to taste the delicious carioca juice drinks and another stop to have lunch in one of the oldest and most historical restaurants in Brazil. In the afternoon we will have free time to take part in various optional activities, such as a visit to the Favela Rocinha or a trip to the Corcovado. Accommodation. And to finalize this day, at night we’ll go out on our Boteco Tour. The botecos are bars where the locals come together to share snacks and a very cold beer at the end of their work day, where happy hour is guaranteed. 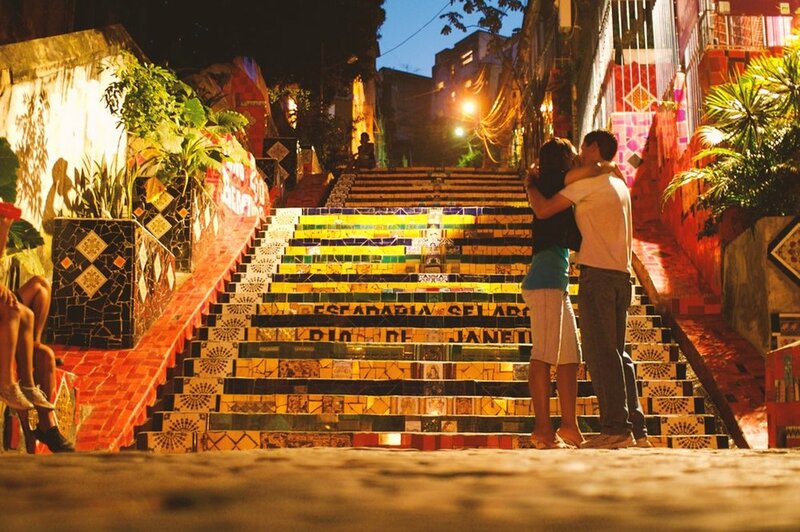 We will start with the neighborhood of Lapa, an area with popular nightlife among the inhabitants of Rio de Janeiro, with a complete experience about the cachaça. Here we will learn about the history and preparation of this essential ingredient for the most famous Brazilian drink; then we will delight ourselves with a spectacular caipirinha! Next, we will visit three bars in Ipanema and Copacabana and we will have the option to enjoy the recommended food and drink (not included). It is worth trying to be a real carioca! Accommodation. Today we’ll make the easiest and most famous track in Rio de Janeiro. The tour starts going by car to Praia Vermelha in Urca neighborhood, where we find the cable car station to the Pão de Açúcar. From there, walking, we'll take the track Pista Claudio Coutinho also known as Caminho Bem Te Vi, which is 1250 meters. The hike takes 45 minutes at most going up slowly; it is great to enjoy the woods, its sounds and animals like marmosets and numerous birds. At the end, we'll take the cable car to Pão de Açúcar. The descent will also be done via cable car and finally we return to the vehicle towards the hotel. Accommodation. Check out and transfer to the airport of Rio de Janeiro for departure to our next destination.